On Wednesday July 25 2018, the NATURA 2000 Value Crete Project team hosted the students and professors of the 7th Summer School of Environmental Journalism at the premises of the Exhibition of Natural History Museum of Crete. Purpose of the students’ visit at the exhibition of the Natural History Museum of Crete was to get familiar with the interactive technologies of the NATURA 2000 Hall presenting all the 54 Protected Areas of Crete and get acknowledged with the ecosystem services of Natura 2000 sites. During their visit, participants were given the 3 informational guides on ecosystem services (coastal, mountainous and rural), as well as posters of the NATURA 2000 Value Crete Project and the publication containing the minutes of the LIFE Themis conference. 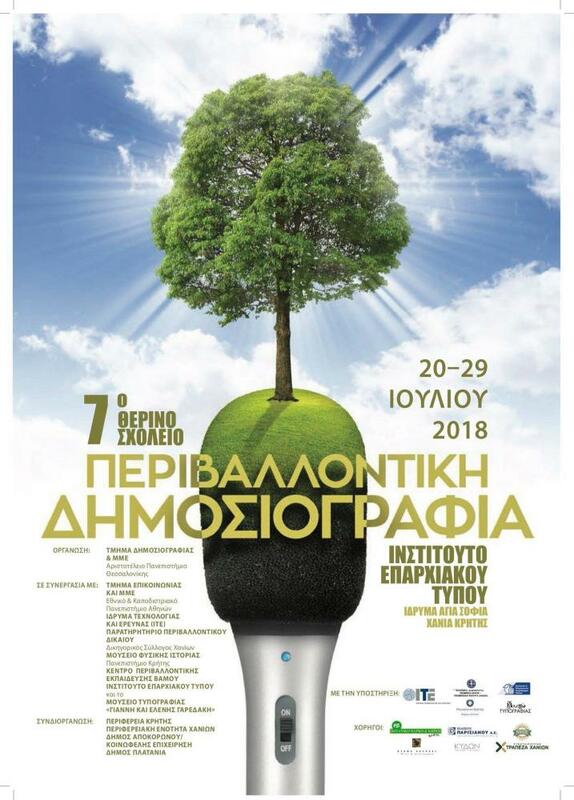 The School of environmental Journalism is annually organized by the Department of Journalism and Media of the Aristotle University of Thessaloniki in collaboration with the Institute of Applied Communication of the Department of Communication and Media of the National and Kapodistrian University of Athens and for second year in the row is hosted at the premises of the Institute of District Press in Chania. The training program of the 7th School of environmental Journalism included educational trips and workshops organized in collaboration with the Regional Unit of Chania and other local authorities. It also included special creative writing workshops for the production of publications relevant to environmental issues. The program is addressed to students of Journalism and Media, Social Sciences, Philology, Biology, Agriculture and Environment, as well as Postgraduate Students of related studies and those who work or have worked as journalists. The School usually hosts 35 participants while the trainers are Professors of the university departments, professional journalists as well as environmental specialists and scientists. With its participation in the 6th and the 7th Summer School of Environmental Journalism, the NATURA 2000 Value Crete Team aims to promote the knowledge about ecosystem services taking into account that the journalists can significantly contribute in raising public awareness through many different channels and are able to strengthen environmental consciousness for the protection and conservation of protected species and habitats.